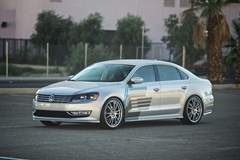 The all new 2012 Volkswagen Passat is the new benchmark for the midsize sedan segment. 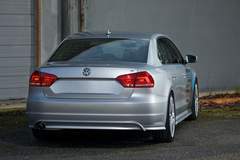 Designed in Germany and built in Chattanooga, Tennessee, the Passat is the only German engineered midsize sedan in the segment. 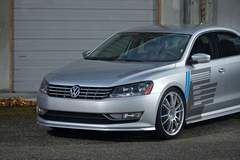 With its clean exterior design, premium standard features and a $19,995 base price, the 2012 Passat is a sophisticated choice at an accessible price. 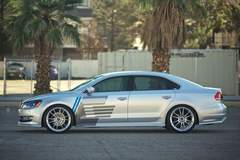 Featuring Volkswagen’s proven 2.5-liter five-cylinder engine and six-speed automatic transmission, the Passat is a perfect candidate for the H&R SEMA concept. 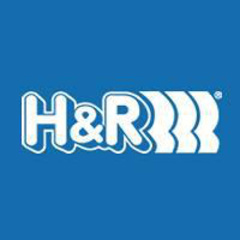 It’s a concept that’s all too familiar to the crew at H&R Special Springs of Bellingham, Washington. 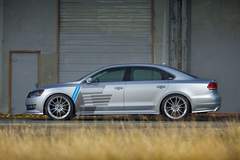 With corporate headquarters located in Lennestadt Germany, the company knows European performance sedans. 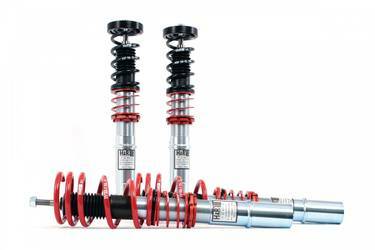 H&R added its famous Street Performance Coil Over suspension for a lower ride height, then bolted on H&R Sway Bars–28 mm front, 24 mm rear for flatter cornering and better steering response. These sway bars are crafted from a special cold formed and heat-treated 50CrV4 steel alloy, and feature forged, seamless bar ends. Each bar is paired with industry-exclusive sway bar bushings made from a unique urethane/Teflon composite that prevents squeaks, yet requires no grease or other maintenance. 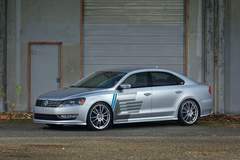 Of course, image is as important as performance, so the Passat was fitted with H&R TRAK+ wheel spacers for wider stance, OZ Ultraleggera HLT 20 x 8 -inch wheels and Michelin 245/35ZR20 Pilot Super Sport tires. 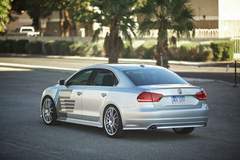 Added to the exterior was a Volkswagen Accessory body kit and rear spoiler. Sticky Jewel Graphics add a custom touch without breaking the bank. 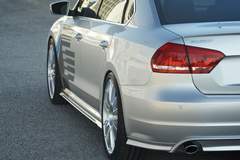 Inside, a set of Volkswagen accessory floor mats compliment the Passat’s high quality interior. 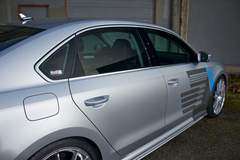 The H&R VW Passat clearly demonstrates that budget and style don’t have to be mutually exclusive–and that a midsize sedan can indeed be striking.